More method, theory, and overall bassoon playing tips in a highly informative book and CD combo. 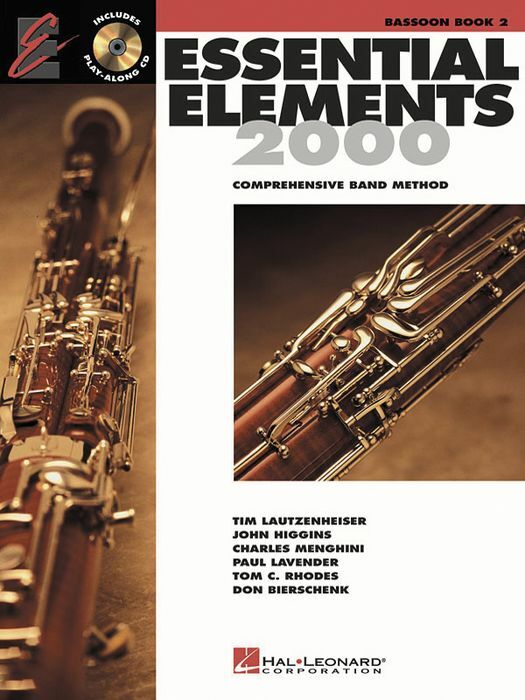 Part of the Essential Elements Method series, The Essential Elements 2000 for Bassoon book 2 with CD features even more bassoon lessons and exercises to increase your skills and knowledge. The instructional pack comes with a CD with more great play-along tracks, covering Exercises 1-55 and Individual Studies (pages 38-41) from the book, as well as a book 1 review section. This thorough package includes a variety of tutorials: Rhythm Raps, Daily Warm-ups, Theory, History, Multicultural Music, Creativity and Assessment, Sight-reading and Improvisation, Etudes created specifically for the bassoon and demonstrated by a professional soloist, Rubank Studies and Solo—designed for bassoon from the very best of student etude and solo literature, 12 full-band arrangements, including a planned concert, and more. Get your bassoon knowledge to the next level by ordering your Essential Elements 2000 Book 2 today!